This is the landing page of a new product that has been inspired by the World Bank through their Massive Open Online Course on Finance for Development. During the course a digital artifact had to be designed that would tackle a pressing issue in the finance for development domain. Though the world is currently convening in Paris around climate change, already impacting so many lives of producers, the financial means to tackle climate change within ones own sphere of influence are often lacking. Taking good care of a crop and the soil is taking good care of agricultural inputs for which often credit is required but not readily available. Following a disaster that badly impacts the harvest, own sources of credit are often depleted and the growing cycle is disrupted and cannot be resumed without external support. One of the most pressing problems of farmers world-wide is access to credit (FAO, 2012). Gender disparities even aggravate the picture for rural women (FAO, 2011). The main obstacle for credit providers is their limited knowledge of the agricultural enterprise which hampers proper risk assessment. One of the features of agricultural credit is its seasonality. At the start of the growing season there is shortage of funds, at the end there is excess of funds. 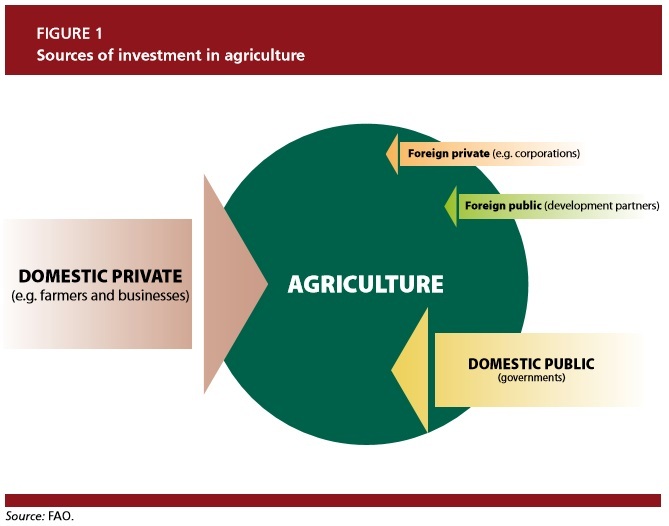 The biggest source of finance for agriculture is local and private. As this is a global reality, increasing public expenditure in agriculture will only marginally contribute to improvements in credit provision. However, there is a lot of scope to mobilize private sources of finance, ensuring risk is spread through global diversification of portfolio's. The solution is therefore simple and straightforward: Turn farmers themselves into credit providers, using their expertise to assess farming risks by connecting farmers globally from one hemisphere to the other, thereby addressing seasonality in financial service provision. Rather than sending excess grain through WFP to fight hunger, farmers can re-invest their profits to buy inputs for other farmers at the start of their growing season. Triple-f brings famers from both hemispheres together in a meaningful way (matching growing seasons, varieties and expertise). U®FIRMS* is the Farmers Investment and Risk Management Service of URAIDE. It supports Triple-f in match-making and brokers a variety of financial products from farmer to farmer. Triple-f network and U®FIRMS will be launched following proper valorization of the business proposition. If you want to receive a heads-up for the launch, please leave your e-mail address. In case you wish to participate in business development for development finance, please join the U®finance LinkedIn group. *) This service is made as a digital artifact for Fin4Dev Massive Open Online Course 2015 of the World Bank and is a prototype only. It currently has no formal nor legal status. Interested investors may contact URAIDE. More info on how the poor manage their money can be found at CGAP.